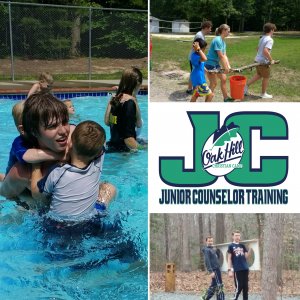 Junior Counselors (JCs) are a vital part of our summer camp program. We are seeking the most mature, hardest working campers to take the next step into this leadership area. The training will prepare you for the various ways in which JCs serve our campers. Each year following summer camp, we look for ways to improve – one improvement we’re making this year is to equip our returning JCs with a 2-hour “JC Refresh Course”. The course will cover any changes to Oak Hill policies and facilities and provide a refresher from JC training. There will be NO COST associated with this course and returning JCs are only required to attend ONE of three MANDATORY the sessions. All sessions are at the Camp. Monday, May 20, 2019 – 6 p.m. to 8 p.m.
Sunday, June 2, 2019 – 2 p.m. to 4 p.m. Since our deans often don’t have weekly contact with our JCs, it is important that we get updates from leaders of their churches. Every returning JC must also submit a Returning JC Recommendation Form signed a church leader verifying the returning JC is doing well spiritually and actively participating in church.